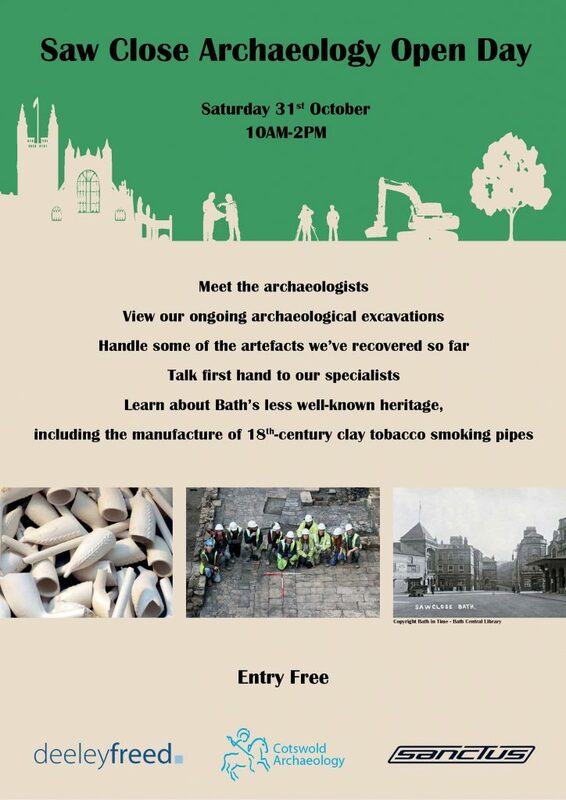 This month Cotswold Archaeology, in association with Deeley Freed Estates and Sanctus, are offering a unique opportunity for the public to see a different side of Bath’s Heritage. On October 31st we will be opening the doors of the development site for the public to view the early stages of an archaeological excavation which has already revealed fascinating insights to one of the less well-known aspects of the city’s past – the manufacture of clay tobacco pipes right in the centre of the city in the 18th and 19th centuries. As work progresses we expect to reveal further remains associated with the medieval, and later Georgian, houses that once stood along Bridewell Lane. The site will be open from 10am for the public to come along and view the excavations in progress, and our archaeologists will be on hand to talk about the history of the site and show off some of the artefacts recovered from the dig so far. Press enquiries should be directed to Simon Cox at Cotswold Archaeology in the first instance.